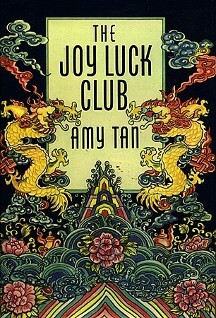 Most of you have probably read The Joy Luck Club, by Amy Tan. If you haven’t, then you’ve most likely seen the movie adaptation directed by Wayne Wang and produced by Oliver Stone. This was my second time reading the book, and it was ironically prompted by my high schooler’s summer reading list. We both enjoyed the audible version performed by Gwendoline Yeo while reading along in the text—my son didn’t need me along for the ride, but I took it as my opportunity to share with him something other than silly memes and the latest in video gaming. I later watched the movie on my own. I remembered that way before children I’d also watched it; Kleenex tissues wedged by my side. Even though this was my second go round, I was thoroughly invested in every triumph and tragedy. The overtly female perspective that Tan probably intended was also a little more evident to me this time. However, this was my son’s reading assignment, so he took notes after reading The Joy Luck Club, while I wondered how much of it would resonate with him. Then I set myself to writing this post. The bonus ended up being the conversation that came from it. I’m sure the Joy Luck Club has been discussed in High School Honors and AP-Lit classes ad infinitum. The challenge I assume for any teacher would be to inform the experience of a high school boy through the story of four, aging Chinese women…then I had my “aha” moment. After discussing gender in Tan’s novel, there actually is ample room for an entirely new conversation; one regarding race and ethnic identity. Tan tells us four distinctly different journeys of four distinctly different mothers—all from China, circa 1930 to 1940. 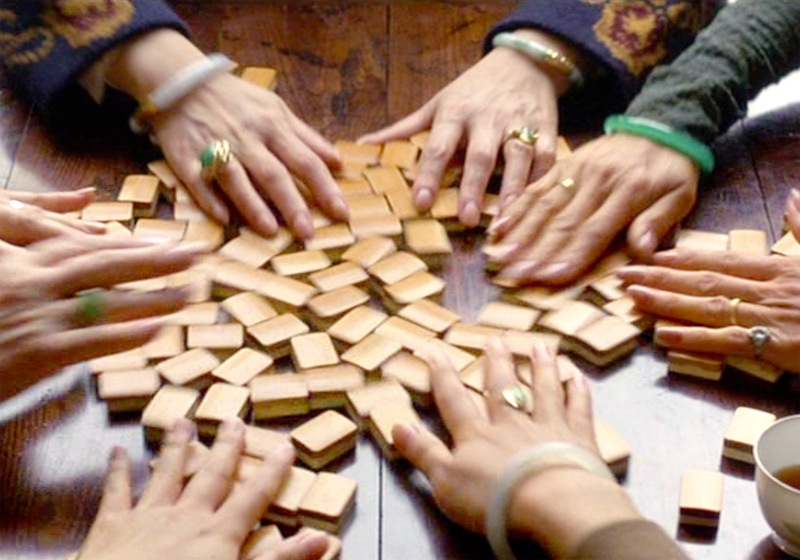 The women have forged a friendship through food, family, and the game of mahjong. They are the Joy Luck Club. An-mei Hsu was kept from her mother and the truth for many years, but finds her value and her voice upon the event of her mother’s suicide. She proclaims that on that day she learned to shout. She demands to be given the dignity that is rightfully hers and that is her newly found little brother’s too. Her demands are granted. Years later, An-mei, the mother of Rose, is wary of Rose’s waigoren (American) husband, Ted. An-mei fears that Rose’s depression over the relationship mirrors that of her once suicidal mother. She can’t get through to Rose. “I still listened to my mother, but I also learned how to let her words blow through me. And sometimes I filled my mind with other people’s thoughts—all in English—so that when she looked at me inside out, she would be confused by what she saw. Over the years, I learned to choose from the best opinions. Chinese people had Chinese opinions. American people had American opinions. And in almost every case, the American version was much better. An-mei also fears that Rose is not aware of her own value. This plays out when Rose receives a $10,000. check from her soon to be ex-husband, sent to “tide her over” until their divorce is final. Is this all she’s worth? Lindo Jong has realized her freedom and success through guile only to find that her daughter, Waverly, has matched her in this. Lindo frets that Waverly finds her and therefore her Chinese identity an embarrassment. Waverly struggles with her mother’s less than encouraging reception of her intended; the red-headed, freckle faced, Rich. Will Waverly see that both she and her mother are reacting from fear? Will understanding lead them to peace? and Ying-ying “Betty” St. Clair who aborted the son of her first marriage—a marriage to a bad man (in her words); an unapologetic philanderer. After having fled this marriage, more than ten years have passed, and Ying-ying is making a living for herself as a shop girl in the city. She meets an American and eventually marries him. He becomes Lena’s father, thus the last name St. Clair. Lena’s story introduces experiences in which race and culture intersect, but is Lena a casualty of her mother’s loss of spirit (chi)? Ying-ying struggles to change this, and we hear it in her narrative that recounts her nature as that of a tiger. Ying-ying wants Lena to stand up for herself, embrace her inner tiger, and set her relationship either with or without Harold straight. All four women place their hopes in the lives of their daughters (and although less mentioned, I expect in their sons). They are in the throes of reconciling what it means to raise first generation Chinese-Americans. The character, Lindo Jong, vents some of this frustration when speaking about her daughter, Waverly. Early in the book we find that the mothers fear that their daughters do not know them. “Knowing” is the key to understanding and Jing-mei shows that she “gets” it. Understanding is the key to identifying as Chinese—their roots. Lindo asserts that Waverly is all American-made. Shared history, culture, and experiences shape the relationship of the women in Tan’s story. She builds a case for their interconnectedness through their first person narrative voices. History is told as “her-story.” In this context the daughters glean their Chinese identity, an appreciation for it, and cultural pride. Tan illustrates that racial and ethnic identity become amorphous when uprooted. She paints a picture of how the transplanted cultural vitality of immigrants can wane generation after generation—it’s one aspect of viewing race as a social construct. So, Suyuan Woo, An-mei Hsu, Lindo Jong, Betty St. Clair and their stories serve as constant gardeners of their descendant’s identity. All parents bear this responsibility. Without stories, we find ourselves inventing traditions to celebrate our uniqueness and we question how we fit into a diverse world. Self-knowledge leads to wider acceptance of others and this is the gift that The Joy Luck Club keeps bringing to the conversation. Suddenly those stories you tell your children about old Uncle What’s-His-Name are viewed in a new light and the game controller can be replaced by a genuine interest in learning more. Enjoy Amy Tan’s The Joy Luck Club by downloading the audio book. It’s performed by Gwendoline Yeo. Follow along in the physical book, because you’ll want to experience every word and spelling from “butong” (the better half of mixed intensions) to “hwai dungsyi” (you bad little thing). Afterward, take in the movie—it’s a completely different experience that will warrant a Kleenex or two. Some might call it a chick-flick, but sensitive guys will totally get it, and we love our sensitive guys. Some of the quotes from this post are useful if read in context, so I’ve included the following endnotes for reference. The photos were found via a Google images search. The featured image is of Amy Tan and her mother, Daisy. The mahjong game table is a scene from the movie. Oh, that makes me ecstatic! It’s why I blog about books. If you do get a chance to read it, hear it, view it, come back and tell me what you think. If it related to your world.